And so have their mommies! It has been a very busy day and a half working to get our four nannies and their eight kids settled. While quite a bit of work, they are also a lot of fun and sometimes we just stop to watch them for a while. We joked with neighbours that we should set up lawn chairs and charge admission to watch them. First, here is a video of the kids playing. 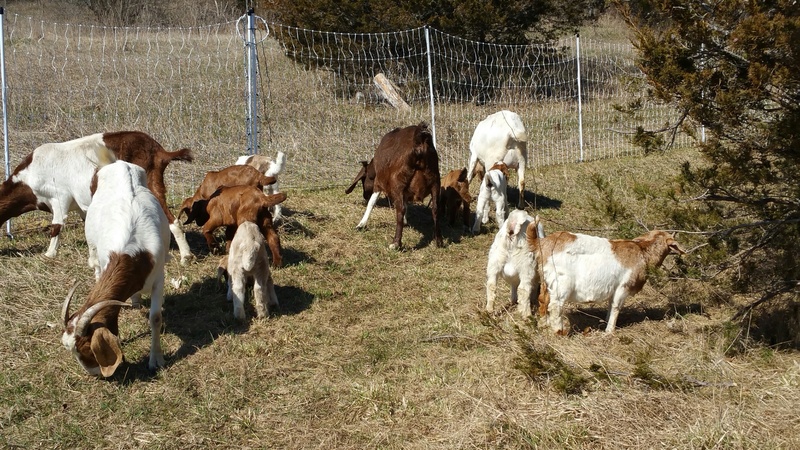 The nannies are Boer goats, a very common meat goat. The kids are Boer – Kiko crosses. 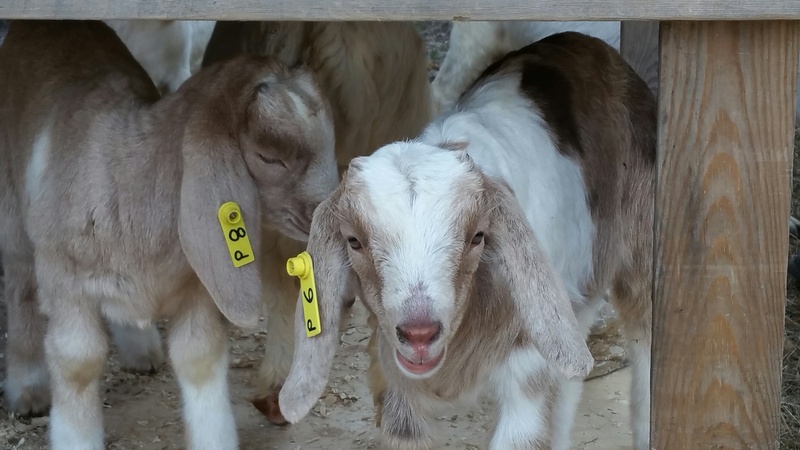 The Kiko originated in New Zealand by cross-breeding feral goats with some European milk goats. The goal was hardiness and the ability to thrive on their own without a lot of inputs from the farmer. They have become quite favoured in this area and Boer-Kiko crosses have become relatively common. Two of the kids are four months old and the rest are just under a month old. Three of them are female and five are males. If all goes well, we hope to keep the females to increase our stock but plan to sell the males at somewhere between four and six months of age. There are 4 nannies and 8 kids pictured here. They don’t stop and pose very well but at least we were able to get them all in this shot. The youngest kids at about three weeks of age. They like to hang out on the platform under the chicken coop. How are the chickens handling the goats invading their world? Generally fairly well. Once in a while we hear a squawk as a goat pushes a chicken away from it and sometimes the chickens object to the kids walking up the plank to their coop. (see video below). But they like the fact that goats sometimes spill some grain that needs cleaning up and they also spend a lot of time near the goat house scratching through the hay and straw looking for seeds. 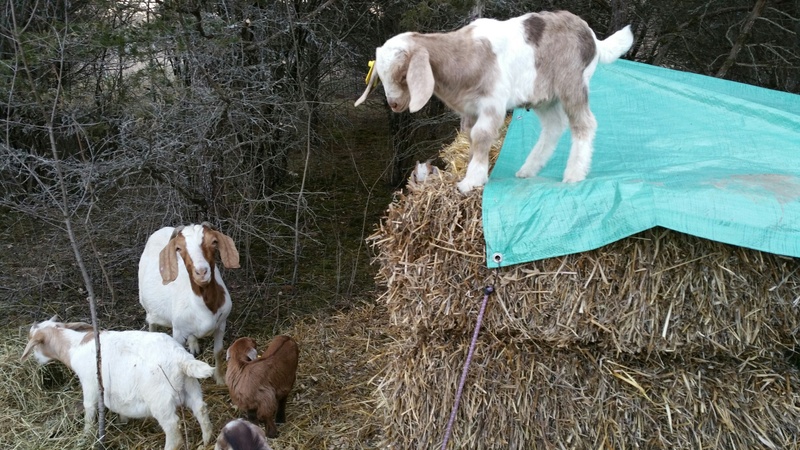 How is the straw bale goat house performing? (see Straw bale house). Not too badly but there have been some problems so far. i. as you can see below, the kids like playing on the straw bales and sometimes knock the top ones off. This kid is about five feet off of the ground. Even though the little goats are not very heavy, the straw bale walls weren’t constructed with dancing kids in mind. ii. the nannies like to scratch their sides by rubbing very hard against the bales of straw. The cut ends of the straw in the bale must feel very good because they keep doing it and push the walls around a fair bit. iii. the nannies are going through what we read is a typical competition for establishing the social hierarchy. Three of the four wanted to be the Queen on the first day and did lots of shoving and vocalizing at each other. By evening one had established her dominance and decided to exert her dominance by not letting two of the nannies and their kids into the house (even though there was lots of room). Eventually she let one of them and her kids in but the other one and her kids stayed outside all night. We hastily erected a small “suite” beside the main house with a tarp and some more bales but the outcast nanny didn’t go into that but just hung around the door of the main house. We improved the “suite” today and hope that at least one nanny and her kids will use it. But from that, our cool straw bale house has been a great success! We hope to post more on these new additions to the farm over the next days and weeks.